Treat yourself to a soothing cup of tea served with a side of traditional style using this classic Farmhouse teapot by London Pottery Company An excellent example of high-quality UK design, this teapot will have you pouring flawless brews every teatime. It has a removable filter to hold loose tea leaves and floral infusions as they steep, without letting any debris get into your cup. Designed by David Birch, an excellent ceramist and director of London Pottery Company, you can be assured of this teapot’s high quality. It’s made of durable stoneware in a vivid aqua colour, with an elongated spout that’s been shaped to prevent any drips or leaks. Treat yourself to a soothing cup of tea served with a side of traditional style using this classic Farmhouse teapot by London Pottery Company An excellent example of high-quality UK design, this teapot will have you pouring flawless brews every teatime. It has a removable filter to hold loose tea leaves and floral infusions as they steep, without letting any debris get into your cup. Designed by David Birch, an excellent ceramist and director of London Pottery Company, you can be assured of this teapot’s high quality. It’s made of durable stoneware in a vivid colour, with an elongated spout that’s been shaped to prevent any drips or leaks. Vintage Indigo captures the elegance of delftware with a modern twist: vintage blue patterns are updated with stylish dark blue roses, woven gingham and polka dots, set against impeccable super white porcelain. Capturing the quirkiness of the contemporary kitchen, Stir it up is a playful collection that places hand-drawn illustrations and fun phrases on beautifully crafted kitchen and tableware. Designed in the United Kingdom, this British bakeware, tableware and textiles collection is one of distinct quality and charming rustic style, featuring materials such as stoneware, acacia wood and cast iron. Stir It Up is a fresh collection with charisma and is perfect for the authentic kitchen.Designed in Northamptonshire, England, by Creative Tops. the Folk Festival inspired by Bohemia is an eclectic collection and is a vibrant Scandi style. I have always felt attracted by decor and bohemian and folk lifestyles. '- Katie Alice. This lovely teapot comes from the vintage-inspired Bohemian Spirit collection and is a perfect addition to any kitchen table at tea time. The pretty floral motifs in bright pink, rich teal, and gorgeous gold decorate this delightful teapot and are topped with a lilac and white lid. With a capacity of up to six cups, this is a great excuse to invite your friends for tea! Or you can match this with other tea pieces for a perfect gift to your tea-loving friends. The art of cast iron working was born in ancient China and the production of teapots is one of the finest achievements of this ancient technique. The teapots, from the forms to the friezes are very diverse and they are the result of an almost exclusively hand-made handicraft workmanship. It starts with drawings, through clay molds and comes to life when casting in high-temperature furnaces.Most models contain a stainless steel filter for the infusion of the leaves. If you use the teapot to boil water, it is recommended that you remove the filter during boiling and use a flame spreader between the pot and the gas flame. 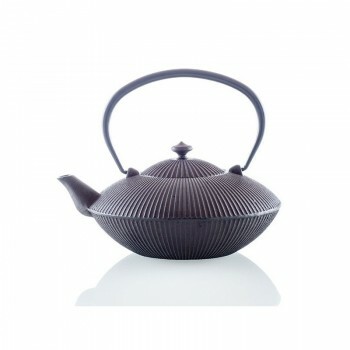 The cast iron used for our teapots is treated in such a way as to remove any impurities during the production process. The pots are then glazed inside in order to preserve the cast iron and to ensure its durability. The external coating is painted with certified ecological paints.